Lake George is located near several wonderful ski resorts and hills. Due to winter's often abundant snowfall averages, most ski centers are able to provide skiing and snowboarding from late November through mid-April. Here's a quick rundown of some top nearby places where you can hit the slopes this season. 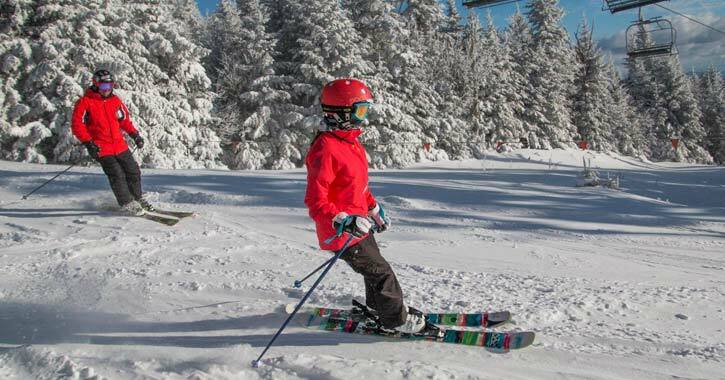 Located a short drive north of Lake George in North Creek, Gore Mountain is home to some of the most skiable acreage in all of New York State. There are 110 alpine trails spread across their four peaks, as well as multiple cross-country skiing and snowshoeing trails with difficulty levels ranging from beginner to expert. The ski resort's 14 lifts will keep you out of lines and on the slopes longer. Gore's vast facilities also include the North Creek Ski Bowl where you can enjoy family-friendly day and twilight downhill skiing, snowboarding, cross-country skiing, and snowshoeing. To visit Gore Mountain, travel north from Lake George for 5 miles to Warrensburg and continue through the town until you reach the intersection with Rt. 28 (on your left), which will take you to North Creek. 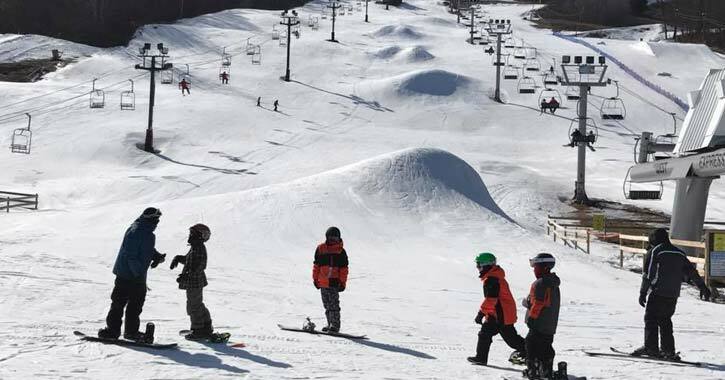 West Mountain is a mid-sized and family-friendly ski resort located just a few exits south of Lake George Village in the Town of Queensbury. While this mountain is great for beginners, there are plenty of trails for people of all skill levels to enjoy. The ski resort features about 30 trails spread across 126 acres. Since it's always hard to predict the amount of natural snowfall each year, West has dedicated snowmaking that can keep over 80% of the terrain covered in snow. Furthermore, if you like the outdoors but aren't interested in skiing or snowboarding, then you can check out West's fantastic snow tubing park instead. Want to practice skiing or snowboarding on some easy trails that are free to access? If so, then the Dynamite Hill Recreation Center in nearby Chestertown is highly recommended. This community ski area has a rope tow, a small hill, and a warming lodge. The entrance to the site is on Route 8, just a few miles west of Exit 25 on I-87 (north of Lake George Village). If you're up for a day trip from Lake George, then Bromley Mountain in Vermont is an excellent choice. This ski resort features more than 45 trails over varied terrain, ranging from beginner to expert level, as well as lots of fun activities for the kids. You can reach Bromley Mountain via Route 149 from Lake George, through Granville and into Manchester. Bromley is 7 miles outside of Manchester, VT.
Also located in Vermont, and about the same distance away from Lake George as Bromley, is Killington Ski Resort. This large ski resort is home to over 200 day trails, including snow tubing, alpine skiing, and snowshoeing trails. Killington receives an average of 250 inches of snow annually, in addition to their snowmaking capabilities. Killington Ski Resort is reached by taking Route 149 from Lake George to Route 4, which you will follow into Rutland and then Killington.